The TPA has today scored a success in Norwich. The Norwich Evening News has printed a selection of our ‘rapid reaction’ letters to the news fed to us by TPA activist Barbara Lockwood. 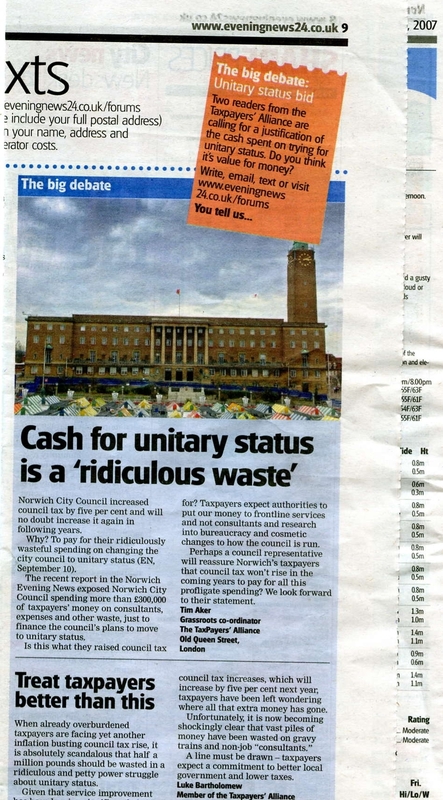 We thought it disgraceful that Norwich City Council spent over £300,000 of taxpayers’ money in a power-grab campaign to change to unitary status. Now the Norwich Evening News readership of many thousands is hopefully going to get involved and ask whether it’s justified that the council wastes so much taxpayers’ money. As you can see, every bit we do helps the cause.